It&apos;s been a hot summer so far here in Central Indiana, which means my family is always looking for ways to cool off. After a full day of playing and exploring, my boys are usually in the mood for a cold treat. We&apos;ve found a new favorite spot in Avon that blends new and old favorites. Danny&apos;s Mexican Ice Cream, located in Avon, opened in August by Angel "Danny" Benitez. Angel is not your ordinary business owner. He&apos;s a 19-year-old Avon High School alum who opened Danny&apos;s just months after graduating from high school. Angel has been working since he was 15, and always knew that he wanted to work for himself one day, rather than for someone else. 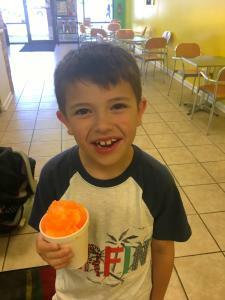 His uncle is a business owner, and that example also inspired him to strike out on his own and open an ice cream shop. 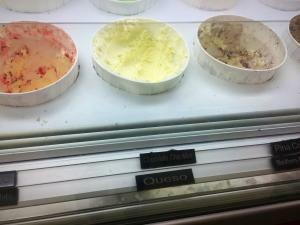 What makes Mexican ice cream different than regular ice cream? The texture and taste of Mexican ice cream is creamier than traditional ice cream. There&apos;s also a focus on flavor. Mexican ice cream uses fresh, natural ingredients to create a rich taste. Angel shared with me that he always strives to use the best, freshest ingredients in all of his flavors. Our trip to Danny&apos;s did not disappoint. I had both peanut butter and butter pecan ice cream, and with both flavors I was impressed by how rich the flavors were. Instead of being overwhelmed by sweetness, the strong point of this ice cream was the taste. My butter pecan scoop was rich and creamy, and my peanut butter scoop tasted just like the inside of a peanut butter cup. My boys opted for snow cones, and they were not disappointed. We also had the chance to sample some more unique flavors at Danny&apos;s. The boys and I sampled flavors such as queso and corn, and we were surprised by how tasty they were! I especially enjoyed the corn ice cream, and would definitely order it in the future. Other unique flavors included tamarind, blackberry cheesecake, tequila, mango chili and Nutella, to name a few. Angel shared with us that his favorite flavor is strawberry cheesecake, which is also popular with his customers. In addition to ice cream, Danny&apos;s also offers sorbet, snow cones and traditional Mexican snacks and beverages. There&apos;s truly something for everyone to enjoy, especially on a hot Hendricks County summer day. Danny&apos;s also is an affordable option for a sweet treat. Single scoops start at $2.50, and if you follow their Facebook page, you can see when they&apos;re having special deals. Danny&apos;s is located at 7730 E. Highway 36 in Avon, in the Avon Centre shopping plaza. During the summer, Danny&apos;s opens daily at 12:30 p.m. and is open from Sunday through Thursday until 9:30 p.m. On Friday and Saturday they are open until 10 p.m.